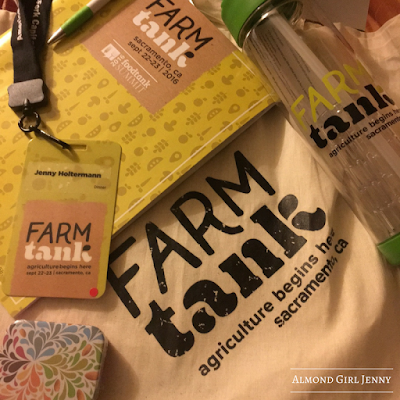 The morning started with check-in where I was greeted with a name tag and canvas bag filled with all kinds of goodies; coupons, clif bar, tin of California Almonds, kale chips, water bottle and sponsor flyers. I sat down at a table with strangers who were quick to introduce themselves and engage in conversation. My table was filled with another farmer, a medical professional, restaurant owner and a food distributor. I felt welcomed and excited for the diverse conversation that was to enfold. The opening speakers touched on their agendas and why they were here today. But the overall message was for all of us to come together and discuss challenges in our food system while building a community of food activists. There were several key messages I took away from the day. The Food Transparency panel kicked off the day. It was very evident after listening to all the panelist that farmers' communication is key and currently not being done effectively. "We need to eat organic because they don't use pesticides" Eric Holt-Gimenez of Food First stated in his keynote. If there are people in food roles and organizations that believe this, farmer's aren't communicating well enough. As a farmer, I know organic farms use pesticides and sometimes more pesticides than conventional. Good, bad or indifferent we should know the facts. So many farmers and ranchers are doing good things, I often feel they get overlooked because of the few who aren't. Many farmers in the Central Valley offer healthcare, benefits, financial assistance for going to school, medical offices on site, daycare or even housing. But a lot of these farms are labeled bad because they are corporations or larger companies. What seems overlooked is they are often times able to offer more because they have more means to do so. Marcia Ishii-Eiteman with PANNA made the closing comment that corporate agriculture was distracting our conversation and forcing us to talk about things they want to. But their contributions are often overlooked because of who they are. We can't lump all farms together and say all corporate is bad, or all organic don't use pesticides. Each farm will do things differently. That is why no two farms are created equal. This is why communication is key. We need to learn from each other and be open to listening. "If farmers aren't taking care of the land, they aren't going to be able to stay in business." John Purcel of Monsanto said this great quote during the Food Technology panel. John isn't a bad guy just because he works for Monsanto, but that didn't stop the audience from booing him as he was introduced. The great thing about large corporations like Monsanto is that they work with small and large growers. He knows and sees all kinds of growers and the one thing that brings us all together is our love for the land. If we don't have a love of the land, we won't be able to stay in business or pass the farm to the next generation. And when our land produces an excess or we have waste on our farm, we need to find a way to utilize it as well. This is exactly what Nick Papadopoulos of Crop Mobster is doing. He is not only taking care of his land but other people's land as well. Crop Mobster gleans and takes donation to distribute to food banks or other outlets who can use them and reduces food waste. He operates an alert systems where you can submit a need and people sign up and share to come together to connect sourcing. Nick also touched on how consumers have turned to convenient food and the need for having things fast. He said we need to get back to the appreciation of inconvenience. Food and farming shouldn't be looked at as convenient, we should make decisions off appreciation. We, as consumers, need to appreciate our meals as a farmer appreciates the land. Every bite we put in our mouth comes from care and love of the land. There is certainly not an easy, fast or convenient means of producing food and there shouldn't be in our means of acquiring our meals. Should seasonality dictate our food choices? Farm Fresh To You Co-Owner, Thaddeus Barsotti certainly thinks so. And during the Infrastructure panel, he discussed getting consumers to buy based off seasonality. He has had great success doing so in his business model and I commend him for doing so. But as I outlined last week in my post, I don't think that would work for the rural mountains of Montana. It was also mentioned, by Keith Knopf of Raley's, the need to leverage retailers to not supply food until it's ready. When you go to the store in January and want grapes, you have to be aware that those aren't local or fresh and traveled on a boat from Chile or Peru to make it on your supermarket shelf. If there is demand for grapes in January, the retailer will fill that demand with where product is coming from. Keith also discussed on education of food to his customers. Do consumers even connect the dots that grapes in January aren't local? Farmers, distributors and retailers all need to work together to ensure we are communicating these messages. General Mills, the largest processing tomato company The Morning Star Company, Clif Bar, Driscoll's, Organic Valley, California Almonds, Blue Apron and Bayer. These are some big names in agriculture and food and they filled the Food Business panel. But don't let their names dictate your impression of them. Jon Bansen is small dairyman from Oregon who belongs to Organic Valley Cooperative. Organic Valley is a well known and recognizable name, but there are over 100 processors across the US to ensure their 1,837 growers' milk products stay within their local communities. When you are buying Organic Valley, you're buying local. Almonds are in deed grown in California, we employ California workers, pay California taxes and contribute to California businesses but we also export almonds and not only feed the world but help to employ worldwide workforce of those connected to almonds in other countries. Richard Waycot, CEO of Almond Board of California, also pointed out how there are over 6,800 almond growers in California and 75% of those farm less than 100 acres. Hullers, shellers and processors are also mainly family owned. 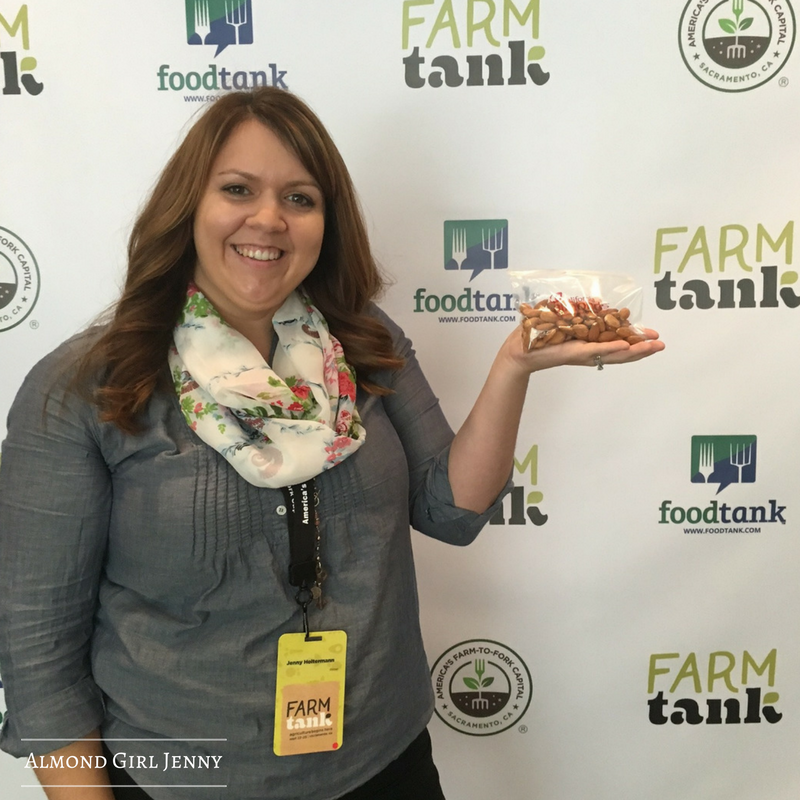 Yes, there are a lot of almonds grown in California but it's families who are doing so. It is all about growing things in the right locale and that might not always be local. - Matt Wadiak, Founder of Blue Apron. He knew we are growing things here in California because it's the best place to grow them. Now this man gets it! After listening to him I am signing up for this service, because he understands farming. California is unique and special. No, I am not just talking about the people in our state, but the climate, soil and farming capabilities within it. Don't let our size foul you, we are specialty farmers who farm massive amounts of food that know one else can do like us. Passmore Ranch is a fish farm who is taking fish poop rich nutrient water and now growing vegetables with it. Michael Passmore is the owner and farmer and like many of us, he is frustrated by the government burden in California. He has expanded his original farm that once only produced fish to now using that high nutrient, fish poop water to grow vegetables. As he pays his employees more though, the extra isn't getting passed down to them. "The taxes that comes from their paycheck is irritating, I'd love to say let's pay our guys more money and they will make more money but it doesn't work like that." Many farmers like Michael wish we could pass more money to our hard working employees but with increased regulations and taxes, a pay raise doesn't always mean more money in their pocket. It's cattle ranchers like Darrel Sweet of Sweet Ranchers who also feels the burden of higher regulations and encroachment of urban sprawl as he raises cattle on mountain grasses east of Livermore, California. Ranchers produce the same amount of beef today as they did in the 70's with millions fewer cows. Ranchers and farmers alike are having to do more with less. We are being sustainable because we have to be in order to stay in business. There are so many messages out there and so many people talking, it is hard to know what to believe. But by being engaged, having a seat at the table and connecting to others with non-like minds, farmers are telling our stories. I found it important to attend Farm Tank to have the opportunity to meet people I wouldn't otherwise and share what it's like to be a 4th generation California Farmer. By starting the conversation and opening up to others, you will have the chance to make a difference. I may have not changed anyone's views on almonds by attending this summit, I may have not educated them on challenges farmers face but I started the dialogue. Communication is key, and now a few more people know who to ask if they have questions.